Our friend Laurie is at home recuperating from a tonsillectomy, OD’ing on popsicles and Jell-O. Solid food is distant on the horizon. Feel better soon, Laurie! I thought something savory might be a welcome break, but it needed to be puréed. Soup was the logical answer. Gazpacho was a favorite cold lunch back in our steamy Washington, DC days. In chilly Wisconsin, I make a tomato and roasted red pepper pasta sauce. This soup is a combination of the two dishes. It’ll be a while before Laurie is ready for anything more intense than Italian ice, but when she is, this soup will be in her fridge. I used roasted red peppers from a jar, mostly because 1) fresh red peppers are still muy expensive here in the Great Lakes (out of season), and 2) roasted peppers are one of those rare foods that are actually really terrific in a jar. Not that Laurie isn’t worth the fresh peppers (you are, Laurie! you are! ), but I happened to have a jar of beautiful Italian roasted peppers in my pantry. 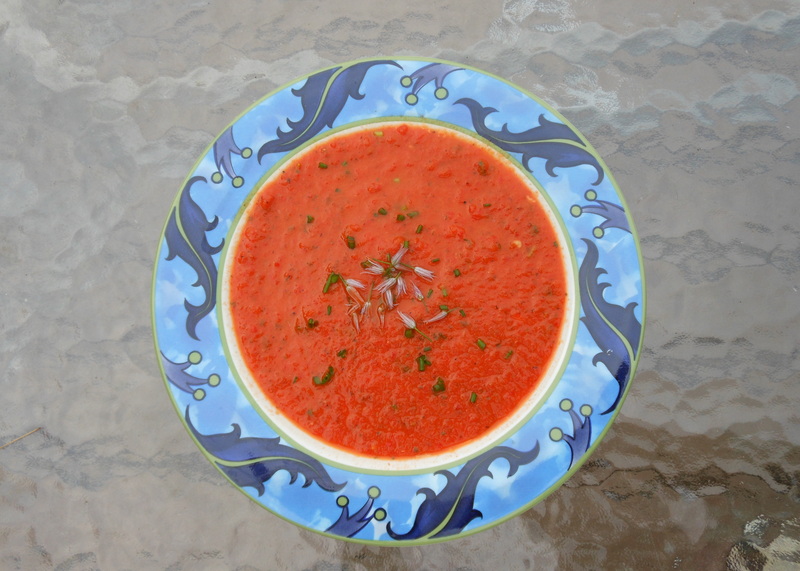 The soup, served hot, is reminiscent of a really good tomato soup, but with a deeper, more complex flavor. Cold, it’s similar to a gazpacho, but smoother both in texture and in taste. That little splash of cream is a luxurious finishing touch. It’s also an effective way to lessen the heat of a too-spicy dish, if that’s an issue. Fresno chiles aren’t very hot, but I wanted to make sure Laurie had a mellow soup for that sore throat. The cream made sure of that. Check out this post and other great soups (and salads and sammies) on Souper Sundays at Kahakai Kitchen. In a large saucepan, sauté the onion and garlic in the oil until translucent. Add the fresno, season with salt and pepper, and sauté until the chile is tender and the onions are lightly browned. Add the roasted red peppers, tomatoes, and stock. Bring to a boil, reduce the heat, and simmer, covered, for about 20 minutes. You’re looking for the veggies to be breaking down a bit, and for the flavors to meld. Purée the soup in a blender or food processor until smooth. Taste and add more salt and pepper if necessary. Stir in the basil, and give it another whirl so that the basil is reduced to green flecks. Stir in the cream. Serve this soup hot, or refrigerate it and serve cold. This entry was posted in appetizers, main courses, soups, veggies and tagged bell peppers, cold soup, peppers, red peppers, roasted peppers, soup, tomatoes. Bookmark the permalink. 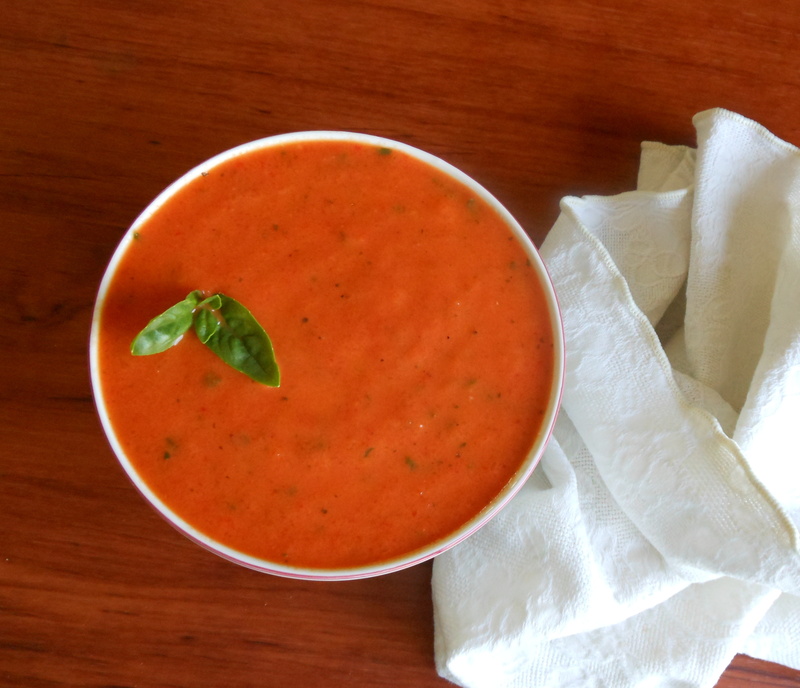 I dearly love roasted red pepper soup and this one looks so rich and creamy. Yum! 😉 Thanks for sharing it with Souper Sundays. The round up is posted for this week and I hope to have you join in again sometime. Thanks so much, Deb. It does have a creamy texture, but it’s still healthy, since there’s only 2 tbs. of heavy cream. Thanks for letting me post on Souper Sundays. I’ll be back–what a great site! Love the color of your soup! You reminded me that I should still have a container of roasted peppers from last year. I also like to add them to a soup. You’re welcome. It’s the least I could do. So glad you’re finally better.